Peel shells off cooled hard-boiled eggs; slice into halves lengthwise. Remove yolks from whites and place in a small round bowl. Mash yolks with a fork into fine pieces. Add 2 heaping tablespoons Mayonnaise, yellow mustard, diced gherkins and finely chopped jalapeno (seeds removed), and salt and black pepper to taste. Spoon mixture into a zip-lock sandwich bag; seal bag and snip off one corner of the bag. Squeeze mixture out of corner of bag into egg white halves. 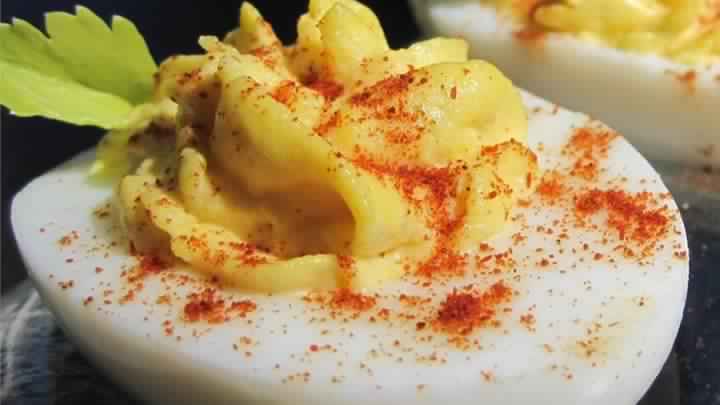 Sprinkle tops of filled deviled eggs with paprika. Chill in refrigerator 1 to 2 hours or until cold before serving.